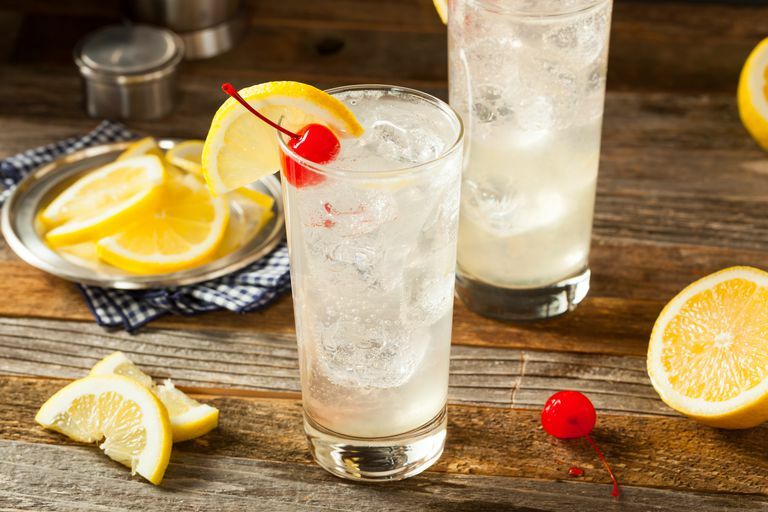 Tom Collins drinks are usually made with a pre-made mixer which contains a fair amount of sugar, but don't let that keep you from enjoying this refreshing drink. The first known Tom Collins recipe dates back to 1876, when it appeared in The Bartender's Guide, by Jerry Thomas. The name "Tom Collins" comes from a well-known prank from 1874 about a fictitious man, named, you guessed it, Tom Collins. According to the story, Collins was a brash man who would trash talk bar patrons behind their back. The prank would then continue with someone telling their fellow bar mate that Collins, who didn't exist, was badmouthing them. The person who thought they were being wronged would then to go over to the bar and ask for "Tom Collins." Instead of being pointed in the right direction, the bartender would then pass them a sour gin-based drink—a Tom Collins. A vodka Collins is exactly the same thing as a standard Tom Collins, only it uses vodka instead of gin. Alternating vodka for gin makes this drink both a low-calorie and low-carb option. Mix gin, lemon juice, and sweetener in a glass. Add club soda to taste, and then add ice cubes. Garnish with lemon slices (you might want to skip the traditional cherry at 2 grams of carbohydrate each).